The Wall Street Journal ran an article yesterday in which much puzzlement and a fair amount of scorn was directed toward the Dutch for not wearing helmets. From the lede on through, the implication is the Dutch are fools not to wear them and it is only a matter of cultural stubbornness that they don’t. While the author spends a number of column inches debating the merits of helmet effectiveness and whether or not people dislike the way they look, what he fails to highlight is the one reason they are unnecessary in the Netherlands: they have the world’s safest streets. 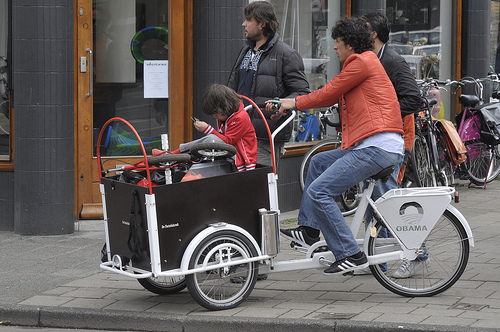 The Dutch are solving their safety issues by addressing the disease, rather than the symptoms. They have the safest streets in the world because they build traffic-calming structures, they don’t subsidize the cost of fuel and parking, and their laws place heavy liabilities on drivers, among many other things. They have chosen to reshape their transportation environment instead of suiting up for battle and hoping to come through unscathed. In the States, we do very little of that. It’s the reason the number one cause of death among children under 14 here is traffic accidents (traffic accidents don’t even make the WHO list for causes of death among children in the Netherlands). Our roads are incredibly dangerous, yet we are loath to address the underlying causes. We couldn’t even get congestion pricing passed in Manhattan. I have ridden in the Netherlands and I can anecdotally say it was the safest, most enjoyable experience I have ever had on a bicycle. I never once felt threatened by cars or trucks the way I did when I rode in New York. Sure, the case can be made that in a fall a helmet will protect a rider and Dutch people do fall off their bikes from time to time. But they, like us, have made collective choices about the limits of their safety. Our cars have seatbelts and airbags, but no one is selling a sedan with a roll cage and a five-point harness or headroom for a NASCAR helmet. Certainly those features would prevent deaths and injuries, but we choose not to drive with them because we accept the risks. We enjoy the convenience of not having to zip ourselves into a fire suit when we want to buy groceries. Why should that be different for the Dutch on their bicycles? P.S. Downhill skiing and cycling for transport are really not comparable activities (re: the article). I see this all the time when people write about helmet use. Urban cycling is a plodding affair. You are lucky ever to exceed 10mph, unless you are one of the X Games-style guys who give us all a bad name. Downhill skiing happens on snow and ice with grades of 30-40% at speeds in the neighborhood of 20mph+. To bring back the auto racing metaphor: a straight highway full of cars at 55mph is nothing like a racetrack full of cars at 200mph, which is another reason why you don’t get into that fire suit for your groceries. P.P.S. David Hembrow has written critically about the Zeeland campaign referenced in the article. He’s a great advocate of the Dutch system. Road safety is also a bigger problem in India. Even here, people don’t give much importance to wearing helmets or other safety measures. The Indian Law also doesn’t give much consideration to this subject and the offenders get away easily by giving bribes. That is why, India registers highest number of road accidents every year. I think you’ve nailed it in this post. So much of the helmet debate centers solely on helmets themselves and not the bigger road and safety conditions that may or may not necessitate helmet use. It’s kind of like arguing whether or not jackets keep you warmer than just a sweater without asking what the temperature is like where you live. Thanks. Great follow-up you’ve written! Thanks! You’ve gained a loyal reader. It isn’t just bikers that need to watch out for themselves here in the US. It’s pedestrians as well. But not only do pedestrians have to look out for each other, they gotta stay alert to other threats…including the minority of bikers who don’t seem to give a s***t that the pedestrians are supposed to have the right of way on sidewalks. I sopeak on this from personal experience both as a current (long time) pedestrian AND a fromer bicyclist. When I had my bike, I ALWAYS yeilded the right of way to the pedestrians on the sidewalk I was riding in anbd they ALWAYS apreciated it…especially if they were elderly or with an excitable dog. I am a French living in the Netherlands for 5 years and I can confirm that biking is extremely safe here. You are totally right in your article, maybe you can mention the fact that there are bicycle roads absolutely everywhere… So basically we don’t share the same roads as the cars, which helps.